Indonesia is a country rich in culture and tribe in it. Culture in Indonesia is very diverse both in the arts, culture or habits, foods, beliefs and others. In discussion this time, we will discuss the culture that is on the island of Nias. The island of Nias, located on the western side of the island of Sumatra, is more or less located approximately 85 miles from Sibolga, the province of North Sumatra. Is inhabited by Nias tribe or they call themselves Ono Niha who still have megalithic culture. Archaeological research has been conducted on Nias Island since 1999 and the results have been published in mass media to discover that there have been humans on Nias Island since 12,000 years ago migrating from mainland Asia to Nias Island during the paleolithic period, there is even an indication since 30,000 years ago. 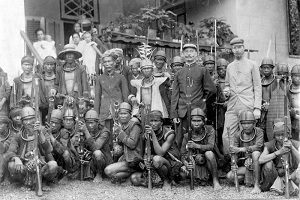 At that time only exist Hoabinh culture, Vietnam is the same as the existing culture in Nias Island, so it is suspected that the origin of the Nias tribe originated from the Asian mainland in an area that is now a country called Vietnam. According to the Nias community, one of the myths of the Nias tribe originated from a tree of life called “Sigaru Tora`a” located in a place called “Tetehöli Ana’a”. According to the above-mentioned myth the first human arrival to Nias Island began in the time of King Sirao who had 9 sons who were sent out of Tetehöli Ana’a for the Throne of Sirao. The 9 sons were considered the first people to set foot on Nias Island. and then start to develop as one community as can be seen right now. 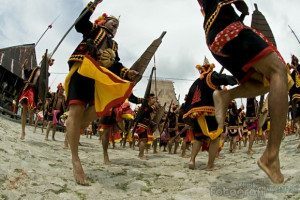 The War Dance or Foluaya is a symbol of the knights of the youths in the villages of Nias, to protect the village from enemy threats, beginning with Fana’a or in Indonesian called ronda or siskamling. At the time of the patrol if there is a signal that the village has been attacked by the enemy then all the soldiers gather to attack the enemy. After the enemy was attacked, the head of the enemy was decapitated to be offered to the King, this is not done anymore because there is no longer tribal war in Nias. This offering is also called Binu. Giving up the beheaded enemy’s head to the king, the soldiers also condemned the enemy by saying “Aehohoi” which means a sign of victory. (Read also : Flag of Indonesia – Indonesia Military Power). After that, the king welcomed the soldiers with great joy by holding a massive party. Then, the king handed Rai, which is a crown to the soldier. Rai in the tribe of Nias is a sign of warlords. Not only was Rai given, frozen gold was also given to other soldiers who had also taken part in killing the enemy. Later, the king ordered “Mianetogo Gawu-gawu Bagaheni”, with a fatele showing agility with a complete jump with his weapon called Famanu-manu shown by two front-facing soldiers. As the times progressed, this tradition also changed its function. 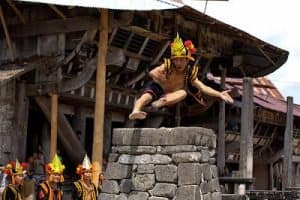 Because today they are no longer at war then the stone jump tradition is used not for war anymore but for ritual as well as a cultural symbol of Nias people. The tradition was held to measure the maturity of a man in Nias as well as a physical and mental test of teenage boys in Nias before adulthood. 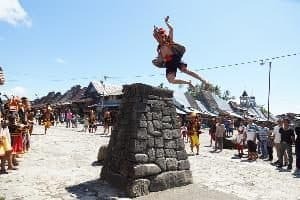 The tradition of stone leaping is done by Nias youth to prove that they are allowed to marry. The stone that must be jumped in the form of a building like a monument pyramid with a flat top surface. The height is no less than 2 meters by 90 centimeters wide and 60 centimeters long. Jumpers jump over the big Stone through a small stone footing before jumping over the big stone. Jumpers not only have to cross the pile of rocks, but they must also have techniques like landing, because if they land in the wrong position it can cause fatal consequences such as muscle injury or broken bones. Its indeed a beautiful danced. Danced by several women, its an unique danced with smooth hand movement, a cooling side of the war dance. Its really nice to see it. Currently a stone relic from the Megalithic period like that which is still good condition can be seen in the villages of Bawomataluwo jo Hilisimaetano. 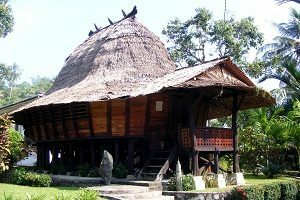 There is a certain type of traditional house formerly used specifically for the houses of the idols of the Nias people, called Osali. Because at the present time a large number of Nias people have embraced Christianity, so the name is also used to refer to the church.